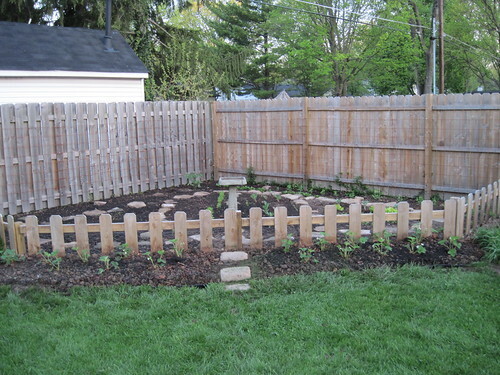 This planting is in the 2010 Vegetable garden . Don’t be too discouraged if the Jewels don’t produce Strawberries this year, because they are June Bearing. I planted June bearing, Day Neutral and Everbearing. You might want to consider a couple of plants of each. This way you can get strawberries right up until first frost, with a large crop in June for Freezing and Jam. Everbearing produce in three main harvests during Summer through Fall. Day Neutral produce non-stop from June through October. If you let your June Bearing Flower and Fruit the first year, your crop next year will be about half of what you’d get if you pick all the flowers off this year. This is always a touch decision. You should plant the runners, pot them, or cut them. They draw energy away from the plant. It looks like you spaced them about a foot apart. Pot the runners in-between, so plants are about 6" apart. I plant each main row in a pattern of 4" apart in 3 parallel rows at 6" apart. Strawberries like being reasonably close. Each plant will produce 12oz. to 1 pound of berries per season. 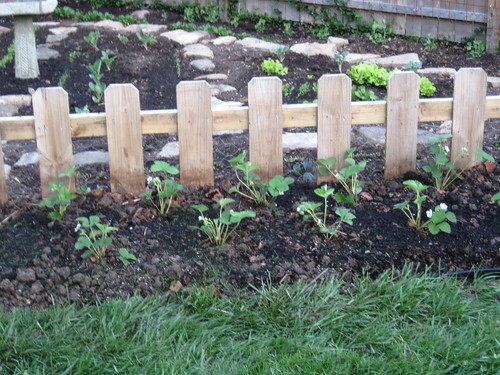 You might want to check out my Journal entry on potting runners, if this is your first venture into Strawberry plants. I have over 2000 plants, so I get a ton of berries (literally). I’ve been growing them since the late 1950’s, so if you ever have questions feel free to ask. I’m eating toast with homemade Strawberry Jam while I’m typing. Good Luck. Thanks for the most excellent advice. I wasn’t planning on getting a harvest this year but was just going to leave the fruit out for the birds, I’ve been told they love strawberries – I’ll definitely pick the blossoms. So you’re saying I should NOT let them grow densely together? I assumed I’d let them grow into a mass like a bedding plant. So I should clip the runners and leave 6 inches between the plants? I’ve got them ~12" apart right now. I’m saying to plant some of the runners between the existing plants. Make sure you don’t clip the runner free until it roots (about 10 days). I have a spacing of 4" apart in 6" wide rows. Your patch will fill in quick, so it’s important to control it, by you spacing them rather than nature. June bearing produce 3-4 runners at a time about every 2 weeks. If you get it too populated it really hurts production. Once you get it fully populated, then clip all future runners or it will diminish next years production. I pot some of my runners for replacing older plants, and give some away to others wanting to start their own patches, and clip off anything I’m not using. Your plants will last about 7 years with production starting to drop off about year six, when it’s time to replace it with a new runner. Gotcha, thank you very much that’s extremely helpful. Where to buy Strawberries "Jewel"